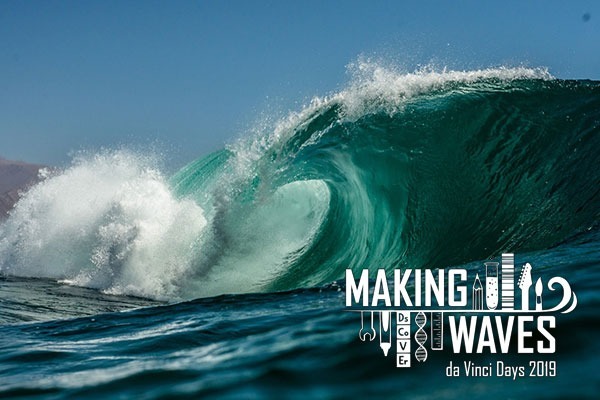 The annual da Vinci Days STEAM Speaker Series will offer the public opportunities to explore the art and science of waves, from the depths of the ocean to the haunting tones of a one-of-a-kind musical instrument and the intersections of art and water. Following the theme of “Making Waves,” the free, family-friendly presentations will be held every Tuesday in April at the Hilton Garden Inn, 2500 SW Western Blvd. in Corvallis. Each talk will begin at 6 p.m. No registration is necessary. April 2, “Echoes from the Deep: Exploring the oceans through acoustics” will feature David Mellinger, professor in the College of Earth, Ocean, and Atmospheric Sciences at Oregon State University. April 9, “Good Vibrations: The spider web harp,” will be presented by OSU engineering researchers Ross Hatton, Chet Udell and Andrew Otto. April 16, “Marine Energy: What, Where, Why, How and OSU,” will be given by Bryson Robertson, director of the Pacific Marine Energy Center and an assistant professor in the OSU College of Engineering. April 23, “Water Stories: An artist’s journey,” will feature Shelley Jordon, a nationally known artist and professor in the OSU College of Liberal Arts. April 30, “Can Math Save Lives? The science of forecasting sneaker waves on the Oregon coast,” will be given by Tuba Özkan-Haller, professor in the College of Earth, Ocean, and Atmospheric Sciences and the College of Engineering at OSU. More information about the speaker series and the annual festival at the Benton County Fairgrounds is available online at davincidays.org. Article courtesy Carole Marie Hobrock, da Vinci Days director.